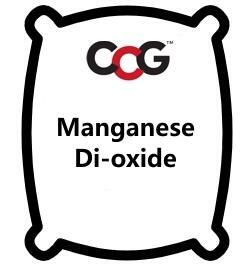 Manganese Di-oxide is also known as Pyrolusite. Above 1080C, half of the oxygen disassociates to produce MnO, a flux that immediately reacts with silica to produce violet colours in the absence of alumina, browns in its presence. Thus if it is being used in glazes fired below 1080C it should be considered as MnO2, if above it should be taken as 81.5 MnO and 18.5 LOI. In glazes it will behave in a refractory manner, stiffening the melt. Because to the expulsion of oxygen at 1080, glazes using manganese should avoid this temperature range to reduce the chance of blistering and ruining of the glaze surface. Manganese dioxide is the key to Rockingham brown wares which are made by employing about 3% iron oxide and 7% manganese in a transparent lead glaze of a recipe such as: Feldspar 28, Kaolin 14, Flint 4, Lead bisilicate 40, Whiting 4. Manganese browns have a different, often more pleasant character than iron browns. When added to terra cotta bodies in amounts around 5% manganese dioxide will produce dark gray to black firing bodies. Large amounts of manganese can produce metallic effects in a glaze. However, these glazes must not be used on food surfaces.